A sacrifice fly from Javier Betancourt in the 13th inning led the Sugar Land Skeeters to a 5-4 win over the Long Island Ducks in Game 1 of the Atlantic League Championship Series on Tuesday night at Constellation Field. Tony Thomas opened the bottom of the 13th inning with a single and moved to third on a one-out single from Denis Phipps. After the Ducks intentionally walked Barrett Barnes, Betancourt delivered the game-winning sacrifice fly. Michael Mariot collected the win for the Skeeters, throwing a scoreless top of the 13th inning, while left-hander Hector Silvestre took the loss for Long Island. 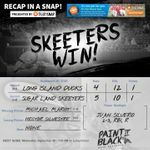 The Skeeters are now 4-0 all-time against the Ducks in Atlantic League Championship Series, as they also swept them to win their first Atlantic League title in 2016. Sugar Land knotted the score up at 4-4 in the bottom of the eighth off Long Island right-hander Jose Cuas. Thomas delivered an RBI single, moved to second on a wild pitch and then coming around to score on an RBI double from Derek Norris. The two-out, eighth-inning rally erased what was once a 3-0 lead by the Ducks. Anthony Giansanti got the Skeeters on the board with an RBI single in the fifth, scoring Barnes. Juan Silverio followed with a sacrifice fly to the warning track in center field to plate Alvaro Rondon and cut Long Island’s lead to 3-2. Both runs were scored off Long Island starter Jake Fisher, who allowed just the two runs over 6 ⅔ innings of work while surrendering four hits. The Ducks jumped out to their 3-0 lead in the first on a three-run homer from Lew Ford. Long Island’s Jordany Valdespin and Daniel Fields each singled to open the game prior to Ford’s home run. Skeeters starter James Russell would not allow a run over the rest of his six innings of work, striking out five batters to three walks while allowing nine hits.